The legendary bag that contributed to the success of Balenciaga – the iconic, the classic and the never-go-out-of-style. To date, the Balenciaga Classic City Bag has gone through many changes; from goatskin to lambskin, thick leather to thin leather (and other way around), different hardware and even introducing the mini version of the Classic City Bag. Introducing the new motorcycle-inspired handbag style, the name is Balenciaga Highlight City Bag. And besides that it is made from durable soft-grained calfskin leather, it is also refined with shiny palladium hardware. More beautiful is the contrasting white leather edges; it adds a bold yet impressive touch to it. All the elements of the original Classic City Bag have been transferred, so no worries. The handles have been hand-stitched; it comes with a removable shoulder strap so you have multiple options to carry. The zipper pull is fine-tuned with special leather tassel. What’s more? The interior zipper pocket is engraved with Balenciaga logo plaque; it also features a double phone compartment in the inside and a leather-framed mirror. For the serious bag collection, you need one of these Balenciaga-history-pieces in your wardrobe. At Bragmybag we not only talk about the latest releases and collections, but we also do like to point out the newest handbags that stand out from the crowd. Whether it’s a classic or a contemporary bag, we love all of them. 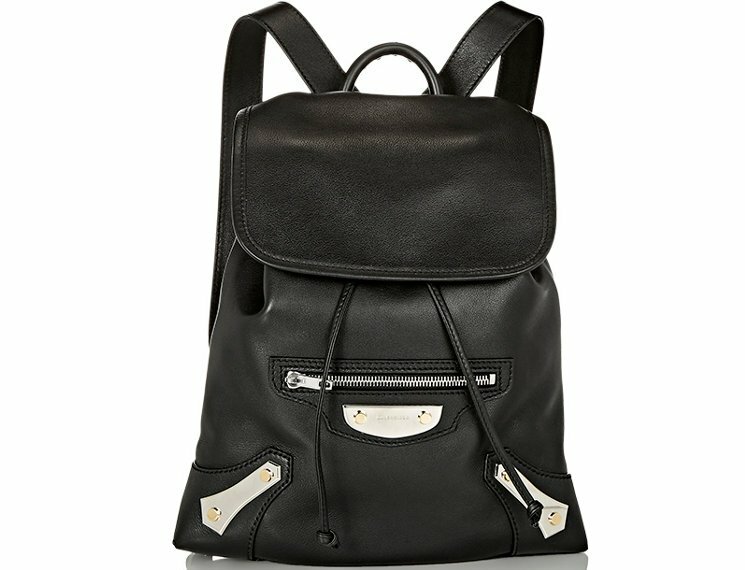 Just like this new Balenciaga Mini City Belharra bag. The Mini City is the smaller version of the popular Classic City Bag and is already well known in the fashion world. But have you ever spotted the newest style called ‘Belharra’? The brand name is printed proudly on the front with the famous France city ‘Paris’, you can’t say no to that right? Made from canvas, which is trimmed, with rosy pink calf leather. And on the top of that, it’s refined with shiny silver hardware, which adds a luxe note to this playful piece. Because it’s partly made from canvas, the experience is totally different. But as a fashion obsessed, you’re obligated to add some different mixes in your wardrobe and perhaps this beauty is qualified for it. The color is perfect for this season and because it comes with an adjustable, detachable shoulder strap, things can’t get better. Carry it on your shoulder or grab the handles. The exterior features a zipped pocket and the interior is made with a zipped and slot pockets. Measuring 6.5’ x 9’ x 4’ (H x W x D) inches, priced at $1085 USD or €925 euro via MyTheresa. Balenciaga introduces a new hardware for the Metallic Edge City Bags. The new Iridescent Hardware is available in the metallic edge and studs on the Classic City bags. It comes in the regular and mini sizes, also the Continental Zip Around Wallet. The Iridescent Bags and Wallet do not include the zip front pocket as seen on the regular City and Continental Zip Around Wallet. The motorcycle Classic City Bag has been a part of Balenciaga’s huge success; they’re stylish and beautiful. And still today, a lot of fans are looking forward to the newest releases – the new colors, leathers and hardware. Now in the recent years, Balenciaga did some new experiments – they’ve introduced new handbag line like the Le Dix Collection. But the fashion house has also released new type of the Classic City Bag – and they did not only change the leathers or colors. Here’s another example; the Balenciaga Metal Plate Classic City Bag is almost exactly like the original edition. But just as its name already revealed, it’s adorned with metal plates to create a bigger motorcycle effect. Made from durable leather, the logo is etched on the metal plate at the front. The bottom edges are refined with metal plate and golden studs, and because the bag is in black, these hardware’s are really create a strong impression. The top features two-way zip closure, it includes a leather-bound travel mirror inside. The bag comes with an adjustable flat leather strap for shoulder carry. Ladies, just see it like this – these are the modern-edition of the Classic City Bag. Available via Barneys. The Italian luxury fashion house Gucci releases a new City Dionysus bags collection – A look at the playful and individual decorations and embroideries on the limited edition collection of City Dionysus bags. Pop and surreal motifs of lightening flashes, pineapple, trompe l’oeil ruffles and bows are appliquéd onto the special limited edition City Gucci Dionysus bags 2016 designed by Alessandro Michele. Glittering pineapple and insects patches shine on the special edition of Gucci Dionysus Hong Kong. On the special Paris city edition of Gucci Dionysus, the words “L’Aveugle Par Amour” (blind for love). Motifs favored by Alessandro Michele, dragonflies, stars and an eye appear on the Gucci Dionysus Dubai city edition. Pop and surreal patches on the New York edition of the Gucci Dionysus. Crafted for the eternal city, the home of the Gucci design studio, the Gucci Dionysus Rome decorated with bees, flowers and an embroidered bow bedecked heart. Bordered in blue studs, the Gucci Dionysus London city edition features the blue-red-blue Web stripe, a sequined serpent, rose and butterfly embroidered patches. Pink and orange sequin flowers and lightening flashes decorate the limited edition Tokyo Gucci Dionysus, designed by Alessandro Michele. The limited edition Shanghai Gucci Dionysus, designed by Alessandro Michele, available starting end of January. For the limited city editions of the Dionysus bags, creative director Alessandro Michele finished each piece with a hand stitched leather patch showing a bee motif along with the name of the city the bag is dedicated to. If you want to glam-up while maintaining a simple, non-intimidating facade, the Louis Vuitton City Steamer Tote is the one for the job! For the office diva who’s trying to balance both style and functionality, this piece is absolutely perfect. Think about the possibilities you can come up with this one! It has all the space and features you could ever wish for in a bag. Since we love LV so much, we were able to feature this exact piece. For more deets about prices and sizes, you can click on the link below. Just know that this baby can carry a lot of your essentials, so you never have to worry! It has Toron handles with Dora handle mounts and a removable leather strap, which allows you to carry it with ease. Get your very own Louis Vuitton City Steamer Tote Bag now!